Imagine if squatters moved into a foreclosed home in your neighborhood, then demanded cash or they wouldn't move out. Authorities say that's exactly what's happening in neighborhoods across Southern California. They call this "cash for keys," because they say, squatters won't hand over the keys to a foreclosed home and leave, until the bank that owns the home pays them cash. Take the case of convicted squatter Gregory Russell. According to court records, Russell illegally moved into a Bel Air mansion, which was being foreclosed on by Gateway Bank. "Mr. Russell is a professional con-man," says Mark Sussman, VP of Gateway Bank. Sussman says Russell requested $25,000 from the bank to move out. "This was extortion," says Sussman. He says Gateway Bank will pay squatters to move out of foreclosures, but no more than $5,000. NBCLA caught up with Russell and asked him, "Have you ever asked anyone for money in order to move out of a foreclosed home?" Russell replied, "No. I have never asked anybody for anything." Russell was eventually charged and convicted of misdemeanor trespass for squatting in that Bel Air home. The year before that, authorities say, Russell was living in a foreclosure in Marina Del Rey. Records show the cops removed him from that house, but he was never charged. Authorities say most squatters who demand "cash for keys" are never charged and prosecuted. "This is a very difficult crime to investigate," says Deputy LA City Attorney Maureen Rodriguez, who has prosecuted several squatters who demanded cash to move out of foreclosures. "These are professional criminals. They educate themselves through the Internet, they know what properties are valuable, they know who's paying cash for keys," says Rodriguez. Rodriquez says Russell is a prime example of a "smart" and "bold" squatter. "He's at the top of the game," says Rodriguez. Apparently, Russell may still be at it. The last two months, NBCLA's surveillance cameras have seen Russell moving stuff into a foreclosed home in Ladera Heights, owned by GMAC Mortgage. GMAC reported to the LA County Sheriff that Russell was squatting in the house, and it appears he wants "cash for keys." NBCLA obtained text messages, which appear to be from Russell's cell phone to the phone of a GMAC representative. In one text, Russell apparently asks for "$20,000 to vacate the house in 10 days." GMAC responds that they'll pay "$5,000 to vacate in two week." In the next text, Russell apparently counters, asking GMAC for $10,000 and he'll be out in 24 hours. GMAC makes Russell a final offer, in writing, of $7,000 if he'll move out in 11 days. Russell didn't accept the offer. So why would a bank offer to pay a squatter to get out of a house that the bank owns? "It is less expensive for the financial institutions to pay someone to move out of the house than to take them to court," says Rodriguez. 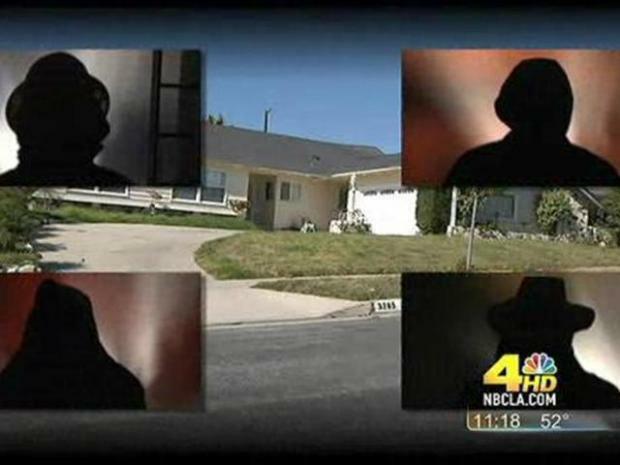 Banks tell NBCLA it can cost $100,000 and take more than a year to evict a squatter through the court process. But neighbors, who live near the Ladera Heights home where we've recently seen Russell, think law enforcement should be tougher on squatters. "Arrest them and they should prosecute them," says one neighbor who asked not to be identified. NBCLA wanted to hear Russell's side of the story, so back in December we caught up with him after a court hearing. We asked him, "Do you make a living moving into foreclosed homes, then demanding money to leave?" Russell replied, "Oh, absolutely not. Who told you that?" Russell said he'd tell us "the whole story" about his activities, and even offered to come to our offices to meet with us. "The 19th looks good. I'll have my lawyer contact you. We will sit down," Russell said back in December. But Russell never did meet with us and his lawyer says he does not want to talk with us. As for the house in Ladera Heights, a GMAC representative says Russell didn't accept their $7,000 "cash for keys" offer. So GMAC has now gone to court to try and evict Russell. Russell presented GMAC with a lease claiming he has a right to be in the house. Authorities say the lease is a fake.